A sense of belonging helps smooth any teen’s path through high school. For sophomore Hannah Rogers, the West High junior varsity dance team is a spot where she feels she fits in. Although she stays on the sideline when the team dances during halftime performances, she knows the moves and the music. Hannah, who has Down syndrome, started practicing with the team during the summer after eighth grade, said Tracy Stanaway, the team’s coach. She could memorize the steps, but her movements were just a bit slower than the team’s. So instead of performing, Hannah became the JV team’s manager. “She’s got instant friends on the dance team,” Stanaway said. Hannah calls them “my girls,” and her devotion to the team is apparent. “She shows up at every practice, every game, every fundraiser, everything,” Stanaway said. “I have to be there for my dance team,” Hannah said. Before each performance, Hannah makes sure team members remove their jewelry, pull back their hair and position their uniforms securely to comply with Montana High School Association rules. During practice, if the girls are chattering, Hannah lets them know they need to quiet down. “Sometimes they listen to her better than they listen to me,” Stanaway said. So far, Hannah has rejected the idea of performing with the JV dance team, but she sometimes dances with them during practice sessions. “When we’re warming up, that’s usually when a song comes on that she jumps up and dances to,” Stanaway said. “Tonight, Tonight” is one of her favorites. Hannah also practices with the Special Olympics dance team, which will perform this summer during the opening ceremonies at the Special Olympics Montana Summer Games. That delight comes across when she dances. “I can just tell that she absolutely loves music and dancing and how free she can be,” Stanaway said. Volunteering as the dance team’s manager has helped build Hannah’s confidence, said her mother, Suzanne Rogers. Since Hannah was little, she has been friends with Joey Lucara, who was the West High football team’s manager for five years. Lucara, who also has Down syndrome, graduated in May but has remained involved with the football team. Joey, who is 20, works in the shipping department at Energy Labs. A former member of the school’s cross-country team, he remains a fervent fan of all West High sports teams. At basketball games, he sometimes sells 50-50 raffle tickets for the booster club. “He knows so many people that he can walk up in the crowd and they’ll generally buy tickets from him,” his mother said. The pair went to TWIRP and the prom together, and Stanaway hopes to get Hannah and Joey to do a dance number together. “There’s so much joy when she and Joey dance,” Stanaway said. She envisions choreographing them dancing on the gym floor surrounded by the dance team. Twelve-year-old Lily Smith is rarely without her mother. Her mother knows Lily will never progress to a point mentally where it will be safe for her to leave home. Lily is one of many that University of Utah researcher and physician, Dr. Julie Korenberg, is trying to help. Korenberg is studying those with down syndrome, hoping new discoveries will pave the way to bettering their lives. "This is the time to apply very basic understandings of the brain to helping people and Utah is the place to do it," Korenberg says. Utah is the optimal place because it has the highest rate of babies being born with down syndrome because most women here choose to keep their baby after they receive diagnosis. "This is a family place. This is a place where people work together," Korenberg says. And that cohesiveness is helping the doctors find many participants willing to take part in her research. "We have a mouse that has down syndrome and we've found that if we just change it's surroundings to a simpler setting, we can help it learn," Korenberg said. With the help of a nearly $3 million grant, Korenberg hopes to find answers to how those with down syndrome can become more self sufficient and possibly how pregnant women could be treated to prevent the disorder from occurring. The grant money will fund the next five years of research. Korenberg says it is only the beginning of the research she plans to do to help better the lives of people living with Down syndrome. Even before Kay Recker gave birth to her daughter, she had a sense about the child and who she would become. Recker believed the baby would be a girl who would be a source of much delight. She also told her doctor the baby would face health problems. Dawn Michelle Recker was born on Sept. 11, 1974. Her first name translates a few different ways: to grow light, to give promise, the break of the day. Dawn, now 37, has lived up to her name in every way, according to her parents, Bob and Kay Recker of Waterloo. She continues to shine despite a nearly three-year battle with terminal lung cancer. "She is the light of my life," Kay Recker said. Recker's other instinct proved true. Shortly after Dawn's birth, doctors diagnosed Dawn with Down syndrome. The genetic disorder causes moderate-to-severe developmental delays, learning disabilities and cognitive impairments. The Reckers remember the marching orders issued at the hospital: Just take her home and love her. The advice also came with a litany of limitations. "I was a very passive person when I married but I think God had other plans for me," Kay Recker said. "I changed that day." Kay Recker planned to love her daughter. She also became a vocal and passionate advocate for Dawn and a tireless caregiver. "My line was always 'time was of the essence,'" Kay Recker added. The family has spent almost four decades making sure Dawn had every opportunity to maximize her full potential, said Bob Recker. who retired several years ago as an engineer for John Deere. Dawn earned a high school diploma at West High School, where she made the honor roll and managed the spirit team. Almost two decades later, special education teacher Tami Sommerfeldt can still recall the polite girl with a friendly disposition who made an effort in the classroom. Dawn was one of Sommerfeldt's first students. "She was always with a smile on her face and a 'thank you,'" Sommerfeldt said. Dawn went on to attend classes at the University of Northern Iowa and held several jobs. Family photos also capture a full social life: Dawn clowning around with her brother. Dawn dancing the night away at prom. Dawn cheering at a football game. Dawn on the ski slopes of Colorado. "Our whole thing was to experience and grow every little bit," Kay Recker said. Over the last month, maximizing life has meant making the most of the Christmas season. From brightly strung lights to beautifully adorned evergreens to hot chili and cheesecake, the holiday has a lot to offer, according to Dawn. "It's my favorite holiday," Dawn said. Earlier this week, she eagerly anticipated the arrival of her older brother and daily Skype partner, Chris, 39, in town to celebrate Christmas. Dawn had their itinerary down pat: Culver's, hot chocolate, Christmas Eve Mass, and SKIP-BO. "I'm so excited," she said. Christmas is a big deal at the Recker household and decorations play pretty significant role in preparing for the holiday, thanks in large part to Kay Recker. Dawn does her part, too. 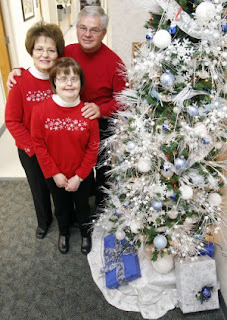 This year, Kay Recker donated and put up trees, ornaments, wreaths, garland, snow people and other festive bits at the Covenant Cancer Treatment Center on Ridgeway Avenue in Waterloo. Dawn has been making trips to the cancer treatment center for two years. Kay Recker wanted to give other patients something to take their mind off their troubles. "I just thought it would be something to brighten their holidays up," Kay Recker said. A miniature pink tree touts the cause of breast cancer awareness. A snowman and sleigh display is meant to conjure up feelings of Christmas long ago. "I thought that was kind of fun and whimsical," Kay Recker said. She has apparently succeeded on all fronts, according to Cindy Staley, a receptionist at the cancer center. But the best medicine may come from an interaction with Dawn: She regularly exudes charm, compassion and honesty. "You don't meet Dawn without falling in love with her," Staley said. "She is such an upbeat --- precious is what I'd call her." Dawn has a way of keeping things simple. A true "clothes horse," according to her family, she readily admits an interest in fashion and accessories. Kay Recker takes some responsibility for the hobby, having taught her daughter to take care in her appearance. "You can say to her, 'Oh, honey, you look darling today.' 'Oh, I know it,'" is a typical Dawn response, Staley said. " ... She's not inhibited at all. So many of the honest things that a lot of people hold back, they just totally come out of her." Even as cancer has spread throughout her slight body, complaints from Dawn are unheard of and tears are reserved for moments of great pain, Kay Recker said. A former hospice volunteer, Kay Recker is surprised they don't happen more frequently. "It's not too bad now," Dawn said earlier this week. "It comes and goes." Earlier this week, the Reckers enrolled Dawn in a hospice program. Kay Recker leans on her faith for solace. "Prayers have been my biggest thing," Kay Recker said. Although she is prone to worry, Dawn is quick to offer comfort. If she thinks her mom is in need of assurance, she is quick to offer a hug or a hand pat. "And Dawn puts her arm on her shoulder and says, 'I'll be fine, mom. Chin up ... ,'" Staley said. Dawn's body has grown weaker but the strength of her spirit hasn't waned, said Rev. Jerry Kopacek at St. Edward Catholic Church in Waterloo. The Recker family attends St. Ed's. "She is one of the strongest, most resilient people it's ever been my privilege to know," Kopacek said. "She has a very deep faith and a very deep love for God and a very strong love for her family." Since the cancer diagnosis, the Recker family has endured more than one health scare. More than once, Dawn has rallied. The gift of time allowed Dawn to travel to Colorado and walk down the aisle as a bridesmaid in her brother's wedding. The Reckers have visited Disney World and New York City. And they have gathered to celebrate another Christmas together. "We've been blessed," Chris said. Katelyn Simpson's journey to become Northwest Rankin High School's Homecoming Queen spread around the state and parts of the country, making her story the most talked about tale of the year for Rankin Ledger. 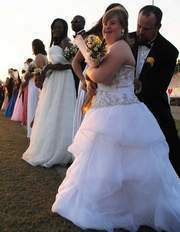 The popular teen, who has Down Syndrome, did not have the requisite GPA to be considered for the school's homecoming court. But with student and faculty support, Katelyn's name was allowed on the ballot, and the cheers ringing from the crowd on homecoming night when Katelyn was crowned Queen let everyone know Northwest Rankin students wouldn't have it any other way. A tearful Katelyn, flanked by her equally tearful father, was surrounded by her peers on the football field, wiped her eyes and turned on her brilliant smile, saying, "Thank you." The work of a service that helps children with Down syndrome integrate into mainstream education is being shared across Europe. Two educational therapists from Belgium have visited the Education Centre for Children with Down syndrome, in Darlington, to see the work that is done there. The centre’s work impressed the pair so much they said they hope to share it with their colleagues in Belgium. Therese Caprace and Dominique Ruidant asked to visit the Education Centre after meeting its founder, Maggie Hart, when she spoke at a conference in Belgium. Mrs. Hart founded the centre in 2004 after her son, Alex, was born with Down syndrome. It helps children learn basic literacy and numeracy to complement mainstream education and also offers outreach work to support children and teachers in schools across the region. When they visited the Darlington centre, Ms Caprace and Ms Ruidant said they were particularly surprised to see the work that the education centre does with babies. Ms Ruidant said: “We don’t work with children that young. It’s the first time I’ve ever seen it done. Mrs Hart said she was pleased the centre was able to pass on some knowledge. She said: “It’s been really exciting showing other people what we do. “For other people to go off and implement what we do is fantastic, but they need to make it work for their own children. “It’s lovely to share knowledge. I’ve found it very interesting. I presumed that they worked with babies, I didn’t know that they didn’t, so it’s been good we’ve been able to give them some advice as we find that early intervention is very important. “It’s fantastic that we’re beginning to reach out from our little base in Darlington across into Europe. Vancouver residents Mark and Rebecca Jenks agreed to pray for a sign about what kind of child to adopt as they were waiting for a service to begin at Hazel Dell’s Messiah Lutheran Church. A few minutes later, about a dozen young people with Down syndrome sat in the pew in front of them, Rebecca Jenks said. “Literally, you don’t get a bigger neon sign than that one,” Mark Jenks said. The Jenkses had researched adopting a child with a disability for about a year before committing to adopt two children with Down syndrome from an orphanage in Eastern Europe: Sydney, a 3-month-old girl, and Lucien, a 2-month-old baby boy. Their names are assigned by the adoption agency; the Jenkses will change them when they take legal custody. The couple found Sydney first on the Reece’s Rainbow Down syndrome Adoption Ministry website. The nonprofit organization connects American families with children with disabilities or HIV from Third World countries and helps families raise money to pay for the adoption. They later found Lucien through the same site. Sydney’s and Lucien’s adoptions will cost a total of about $30,000. So far, the family has raised $1,301 through its two blogs, the Reece’s Rainbow website and its church community. Rebecca Jenks’ 15-year-old daughter, Tamara Emler, first spotted Sydney’s photograph. The Jenkses were married in 2008. 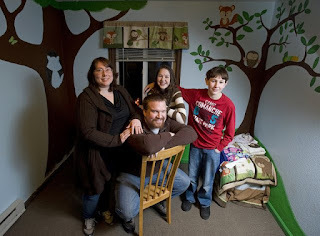 Rebecca Jenks, a preschool teacher, has four children from her previous marriage. Two of them are adults and have moved away from home. The other two children, Tamara and Brandon Emler, 13, live with the Jenkses at their home in Meadow Estates, just north of Walnut Grove. Mark Jenks, a computer help desk technician, has no children of his own. He and Rebecca Jenks said they want to experience having children together. Having read about the scale and condition of orphaned and abandoned children around the world, the couple opted for adoption. Their search seemed to gravitate toward children with Down syndrome, Rebecca Jenks said. Reports about the treatment of children with mental disabilities in Eastern Europe added to the family’s certainty that they wanted a child with Down syndrome from that region. In that region, children with mental disabilities are often given up by their parents for adoption due to the social stigma of having such a child, as well as scarce government resources to help parents raise a child with special needs, said Andrea Roberts, founder of Reece’s Rainbow. Once they’re surrendered to the state, the children frequently are institutionalized for life, first in an orphanage and later in a mental institution for adults, Roberts said. Brian and Rachel Davis of Hillsboro, Ore., recently adopted a 2-year-old boy with Down syndrome from Bulgaria. Brian Davis and his mother brought the toddler, Jordan, home Dec. 3. Rachel Davis, who also has two biological daughters, ages 2 and 4, said raising a child with Down syndrome isn’t dramatically different than bringing up a typical child. The main difference is that children with Down syndrome often have more medical needs and are developmentally delayed, according to the National Association for Down Syndrome. The children are at greater risk of heart defects and infection. They’re also subject to more incidence of respiratory, vision, hearing and thyroid problems. In the spring, the Jenkses plan to travel to Sydney’s and Lucien’s country to complete their adoptions. They plan to rename her Olivia Ann and him James Antonio. Rebecca Jenks said some of her friends and family members think she and Mark should enjoy their freedom after Brandon and Tamara leave the house. But she said after researching adoption, she feels passionate about moving forward. To make a donation to help pay for Sydney’s and Lucien’s adoptions, visit Mark and Rebecca Jenkses’ blog at orphanrescuemission.blogspot.com. State Senator Michael Rubio says he will not run for Congress next year. In a statement on his website, the Democratic Senator says he and his wife recently had their second child, a baby girl, born with Down syndrome. He says his daughter's birth reminded him of his priorities in life - that family comes first. "It would be easy to continue my candidacy for Congress with thoughts of being engaged in the difficult issues that face our nation today. But my family needs me more today than Congress does." This fall, Rubio started an exploratory committee to begin fundraising, but instead he says he will continue his fight in Sacramento. Reece's Rainbow: a Maryland-based non-profit organization headed by Andrea Roberts. Reece's Rainbow lists disabled children that are up for adoption. 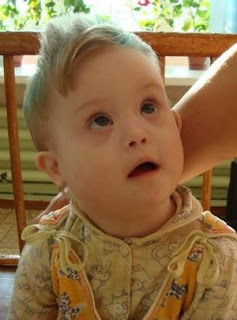 Most children are from eastern Europe, diagnosed with Down syndrome. To date, they have helped facilitate the adoption of nearly 600 children worldwide and raised more tens of thousands of dollars. Bible Orphan Ministry: a Ukraine-based charitable ministry run by Misha Glazov. He and his team of volunteers minister to approximately 1,000 orphans in Ukraine, many of them disabled and housed in mental institutions. Their visits often bring the only toys, books, clothes and fruit the children ever see. - Donations of children's clothing and shoes. - Cash donations they can use to purchase fruit and vegetables for the orphans and pay for gas for their trips to the institutions. Learn more here: http://www.bibleorphanministry.com/ and click on the "Donate" tab. Children born in Eastern European countries with Down syndrome ( or any other "disability") are viewed as worthless and defects. They are sent to an orphanage shortly after birth. If they are not adopted by the time they turn 4 or 5 years old, they are sent to an adult mental institute where 95% of them die within the first year. They are tied to cribs, left to sit in their waste all day, and then thrown on a hard cold floor to be hosed off. They are starved to death. This fact is something that Adam and Lauren Evans of Poulsbo cannot ignore. Adam is a United States Marine stationed at Bangor and Lauren is a stay at home mom. Adam and Lauren have three boys, ages 4 years, 3 years, and 17 months. After much research and time spent on reecesrainbow.org, an advocacy group for such children, and many prayers, Adam and Lauren decided it was God's will for them to adopt a sweet girl with Down Syndrome. In September 2011, they committed to a beautiful little girl listed on RR, named Amanda. This beautiful little girl turns four in March. Depending on the region she lives in, she could be transferred to an institute that is not even fit for an animal, let alone a CHILD. The adoption costs range from $25,000-$45,000,with Amanda's ( Adam and Lauren will be naming her Alaina Jo) region costing around $34,000. They took a leap of faith, knowing that God would make sure that every need was met. Currently on their blog www.yourlovewillcarryme.blogspot.com they are holding several fundraisers, including a silent auction. Any support you could offer them and this sweet girl this Christmas season would mean the world to them, even if just an encouraging word is shared. For more info on the plight of these children and adoption, please visit www.reecesrainbow.org. Whoopi shares a sweet story about a young man with Down syndrome who knows the true meaning of Christmas. The annual rate of children born with the chromosomal condition was 60-80 between 1999 and 2009, whilst it was 40-60 in the ‘80s. Foetal screening introduced in Scandinavian neighbours Denmark and Sweden has meant numbers of Down’s births are declining. Norway’s Institute of Public Health believes the increase is due to a higher number of older mothers. Mette Weitemayer, leader of interest organisation Ups and Downs’ Telemark branch, welcomes the news. “There is no reason to opt out from having children with Down syndrome. Parents, others who know people with Down’s, and I feel a sadness when hearing it’s possible to opt out [from giving birth to] these types of persons,” she says to NRK. Glenn and Tonje Borger Clausen tell the broadcaster they have no regrets about having Ludvik, who was the subject of harassment on Facebook because of his condition. Erin Farragher is fond of a large poster picturing children she modeled with at the recent Be Beautiful, Be Yourself Global Down Syndrome Foundation Gala. She smiles as she proudly points to the photos of those who have become her friends since the Washington, D.C., event. “The poster is her trophy,” explained her mother, Maria Dellapina. Erin, 12, who lives with Dellapina in Burton Village, has Down syndrome and was chosen to model for the fundraiser benefitting the Linda Crnic Institute for Down Syndrome at the Anschutz Medical Campus at the University of Colorado in Denver. The audition tape showing Erin sporting her sister’s party frock caught event organizers’ eyes and landed her the runway spot. Once chosen, Erin, who attends Geauga Project Achieve in the Kenston School District, practiced for the special occasion by promenading around the house and waving ceremoniously. The rehearsal served her well as she successfully strutted down the gala’s runway. Although she had several dresses from which to choose, she said her selection was based on its pleasing pattern with a look of peacock feathers and was cut in such a way that she could twirl in it.Meeting a few celebrities and politicians in attendance was another perk. Supermodel Beverly Johnson, the foundation’s spokeswoman who has a niece with Down syndrome, took a significant amount of time with the models, which made Erin especially happy, Dellapina said. Erin’s bright smile and hearty nod affirmed her mother’s assessment. Erin also had a chance to meet actor Jamie Foxx’s sister, DeOndra Dixon, the ambassador for the foundation, and she danced with entertainer and songstress Gladys Knight. Politicians attending the event included U.S. Sen. Tom Harkin, D-Iowa; and U.S. Rep. Pete Sessions, R-Texas; both advocates for the genetic condition affecting 5,500 children born each year in the U.S.
Dellapina, who was inspired by her daughter to initiate the business Spec4us, which provides custom frames for people with Down syndrome, said she noticed some of the models wearing ill-fitting eyeglasses and has since helped some of them. With an optical technician background, Dellapina said she recognized the need for the customized glasses when she was unable to find a pair to correctly fit Erin. She sent her own designs — which revised standard glasses to fit the facial features often associated with Down syndrome individuals — to some manufacturers and eventually found one in South Korea with whom she is working. Dellapina said the need for such a service is obvious. She often receives positive feedback from many people, including some who said that before the adjusted frames they chose not to wear glasses because they were too uncomfortable or didn’t work. “I just feel blessed that we are able to enrich their lives, and they can participate in school and see the world more clearly,” Dellapina said. Meanwhile, Erin is still basking in the memories of her modeling experience. “I think the smile on her face while she was on the runway said it all,” Dellapina said. Mother and daughter plan to return to the gala next year, and Erin is especially looking forward to reuniting with her friends. “I know when we are back … she will remember each one of them,” Dellapina said. When Gemma Andre submitted photos of her young daughter, Taya, to a UK modeling agency at the urging of a family member, she didn’t say anything about the fact that Taya was born with Down syndrome. “No one asked the question, ‘Is your child disabled?’ So I didn’t mention it,” Gemma told the Daily Mail recently. Even after the ad agency, Urban Angels, phoned Andre and told her that Taya had made the first cut, and they would like to meet her personally, Gemma stayed mum on her daughter’s condition. “I didn’t want her to be chosen as the token disabled child. If she was going to be picked, then it had to be on her own merit,” she says. It turns out that Gemma didn’t have to be worried: after going in for a photo shoot with Urban Angels, Taya was chosen as one of the few lucky child models for the agency. “When the agency rang me and said, ‘We want her on our books. She’s absolutely beautiful’, I was delighted,” says Gemma. “I asked them if they were aware she had Down’s Syndrome. They said: ‘It’s immaterial. We’ve accepted her.’” At that moment, says Gemma, she burst into tears. Taya’s story is a rare tale of non-prejudice at a time when in many Western countries more than 90% of children born with Down syndrome in utero never get the chance to see the light of day – instead being aborted in the womb in a modern-day resurrection of eugenics. But for her part, Gemma says she never even considered getting the tests done that might have revealed her daughter’s condition, since she and her partner had resolved “to love whatever child they were blessed with,” in the words of the Daily Mail reporter. However, she does confess that it came as a blow when, shortly after birth, the doctor announced that Taya probably had Down syndrome. However, since then Gemma says she has not only adjusted to her daughter’s condition, but has come to embrace it. Taya Kennedy is rocking the modeling world. The 14-month-old's mother submitted her pictures to a top British modeling agency, and soon after she got a call saying they liked what they saw. A photo shoot followed, and Taya has since been lining up the gigs as advertisers are drawn to her bright smile and natural chemistry with the camera. It's your typical baby modeling story, only Taya isn't typical -- she was born with Down syndrome. The agency says that, however, has nothing to do with why they or advertisers love her; her mother says it has nothing to do with what she will accomplish in life. It's an inspirational story all around. That she has Down’s Syndrome did not enter the equation. We chose her because of her vibrancy and sense of fun. Not all children are comfortable in front of a lens and with a photographer looking at them — especially when they are so young. But Taya was so relaxed and happy. She was just what we were looking for. When you look at the gorgeous pictures of Taya, you see nothing but a beautiful child. Any limitations that she may face are nowhere evident, and she's such an amazing reminder of the beauty -- both internal and external -- in faces that many deem tragic. Her mother, Gemma Andre, told the paper that people often feel sorry for her when they learn Taya has Down syndrome, but she sees her daughter as a gift. She said at birth, she was given a list of all the things Taya wouldn't be able to do and delays she would encounter. One by one though Taya is busting through them all and appears to show no sign of slowing down. With Taya you get the whole package: she has her difficulties, but she is clever, strong, and she laughs all the time. She has such an expressive little face. People say, "Don’t you wish she was a normal child?" but without her disability she wouldn’t be Taya, so we wouldn’t change anything about her. I hope to see her on the cover of Vogue one day. Each contestant may submit a maximum of 3 entries in any combination of these genres. For example, 1 painting, 1 story, and 1 poem OR 3 paintings OR 3 poems. Please do not send anything not listed above. In particular, do not send nonfiction (e.g., autobiographies), scripts, photographs, films, music, or anything made with a kit. Remove artwork from frame, if possible. Make a good quality scan or take a high resolution, close-up photo (at least 300 dpi) of your creation. Photograph your art against a solid-color, non-reflective background, if possible. You may get the best result by photographing it outdoors, in natural lighting. If your work is 3-dimensional (ceramics, sculpture, etc.) feel free to take 3-5 photos from different angles. Type your submission on a computer. Save it as a Word or plain text file. Fill out both Part 1 and Part 2 of the entry forms. Download either format below, fill in, and email to submit your entry. Microsoft Word Forms--If you have Microsoft Word on your computer, you can click on the links below to open the files in Word, fill out the forms, save them to your computer, and attach the filled-out forms to an email with your creative submission. PDF Forms--Click on links below to open forms in Adobe Acrobat. You will need to print these out, fill in by hand, scan the completed forms, and attach these scanned filled-out forms to an email with your creative submission. If you do not have Adobe Acrobat on your computer you can download it for free from here. c) a digital photo of yourself. Please ATTACH these items to the email rather than embedding in the body of the email. Address your email to DScontest@woodbinehouse.com. In the subject line, put DS Contest Entry. In the body of the email, type the title of your creation and your name. Send it! Enclose a) a print-out of your writing OR a scan/photo of your artwork printed on good quality paper OR a scan/photo of your art saved to CD; b) Parts 1 and 2 of the entry form (download forms from Step 2 above and fill in); c) a photo of yourself (digital photo saved to CD or print). Do NOT send original artwork under any circumstance! No artwork will be returned! Do NOT send us your original artwork! It will not be returned, and it may be lost or damaged in the mail. Woodbine House assumes no responsibility for loss or damage to unsolicited artwork. Do NOT send us your only copy of a story, poem, or other creative writing. It will not be returned, and it may be lost or damaged in the mail. Woodbine House assumes no responsibility for loss or damage to original copies of creative writing. Do not send artwork that incorporates copyrighted or trademarked images created by others (e.g, Buzz Lightyear; Coca Cola). Do not photoshop the image of your work. Please do not call us or write us to check whether we have received your entry or whether you are a winner. We will contact you to let you know if you are a winner. If you are a winner, we may ask you for more information or to send us your original art. Please do not fax entries or entry forms to us. Either email or mail them to us, as described above. Winning entries will be selected on the basis of creativity, originality, artistic merit, and overall impression. Woodbine House hopes to select about 100 winning entries. Each winner will receive one copy of the published book and $25 for each winning entry selected (up to a maximum of 3 books and $75). Woodbine House reserves the right not to publish a book if insufficient entries satisfying the selection criteria are received. Please note: inclusion of your work in our book will not in any way prevent you from selling, distributing, or exhibiting your work elsewhere. You will retain the copyright to your work. Deadline to enter: January 31, 2012. Winners will be notified by March 1, 2012.